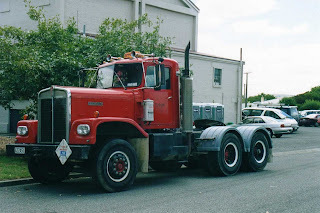 The Road Ranger Blog: Those With a Nose. 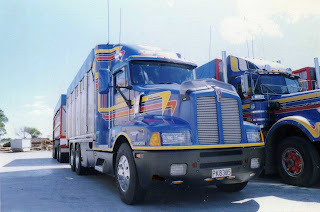 I have done a blog on Kenworth COEs so here are some KW conventionals (normal control, long nose). 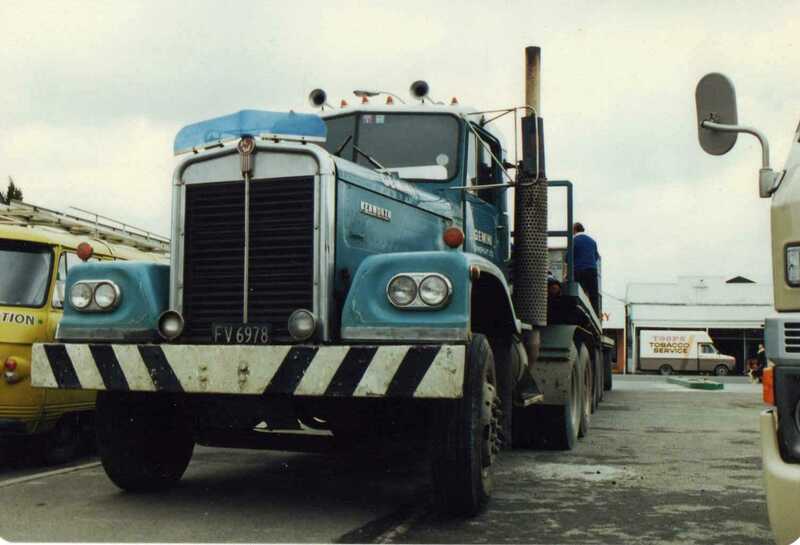 The first conventional Kenworths arrived in NZ in the mid 60s. These were Canadian sourced models with fixed mudguards and aluminium, butterfly type bonnets. 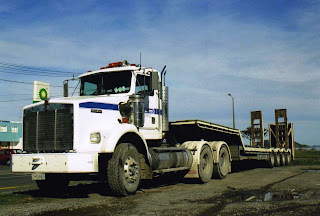 Most had 335 HP (or less) Cummins power driving through a 13 speed Roadranger. In comparison to later models the radiator grilles were quite narrow, so are often referred to as "narrow nose" or "needle nose". This is a 1971 LW924 unloading a transformer at a new supermarket in Masterton. 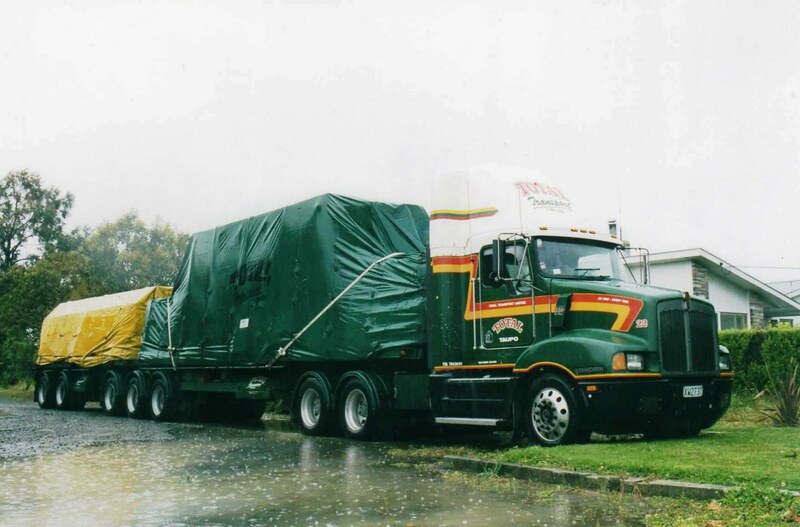 Tudor Enterprises use this LW925 to transport a semi-trailer fitted out as a toilet and washroom for use at outdoor events. 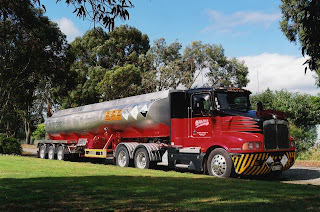 Seen here at Martinborough for the fair. 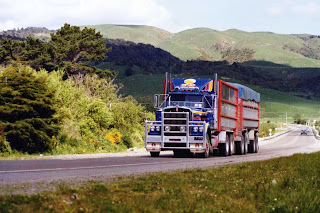 Martinborough is a small rural town, about 30 mins drive South of Masterton, which twice yearly runs a fair where traders of crafts and giftware can set up a stall to sell their items. 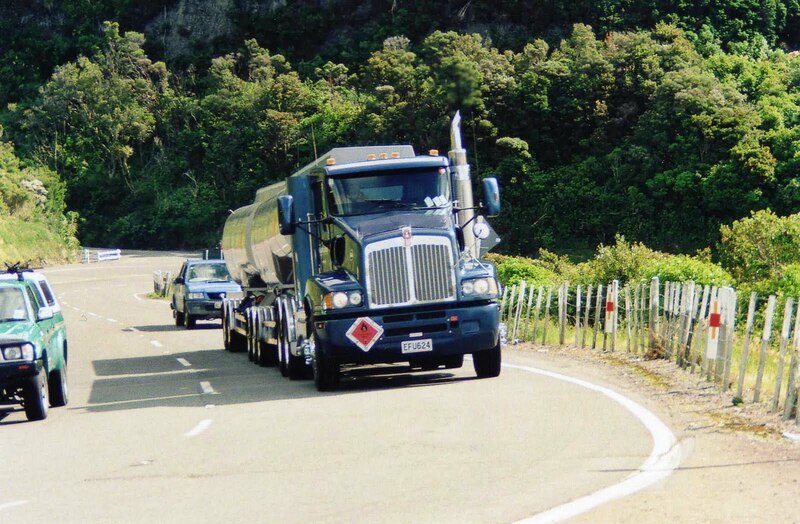 This has become a hugely successful event attended by people from all over NZ. A 1973 LW924 is parked in Ngauranga Gorge on State Highway 1 just North of Wellington. It is operated by Hire Pool Sky Towers. 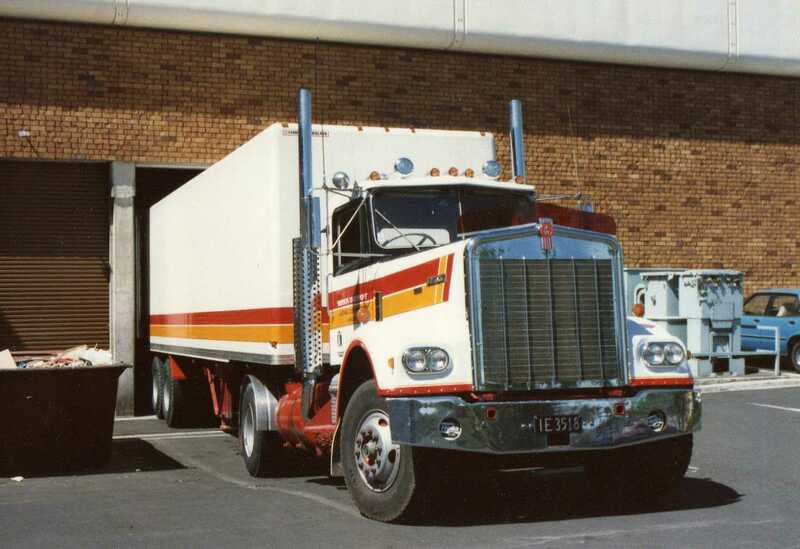 This 1972 W924 has the one piece fibre-glass bonnet and front guards but still has the narrow grille. A grille of this size, I would think, would be only capable of cooling a motor of no more than about 350HP. 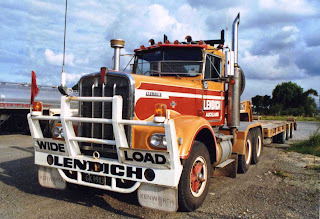 This Lendich of Auckland rig was photographed at Dargaville in NZs far North. TD Haulage run KW tippers pulling full trailers to cart sawdust and shavings. 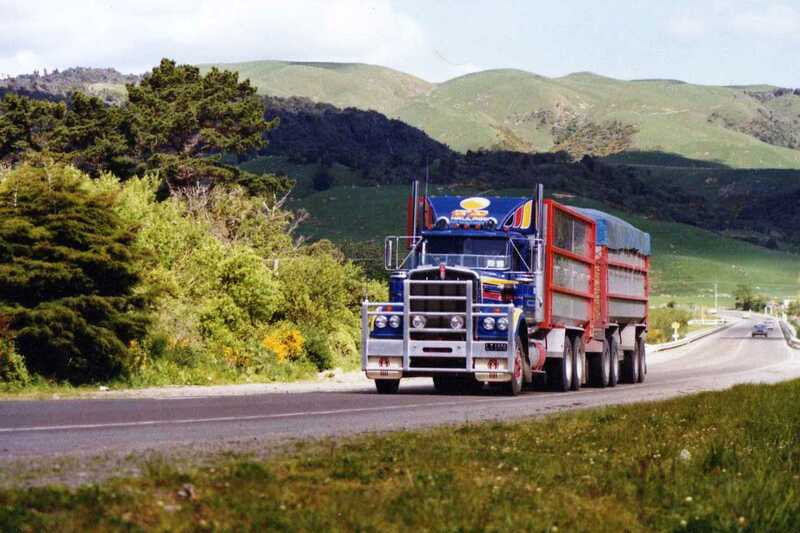 This 1984 W924AR has just crossed the Manawatu River after coming through the Manawatu Gorge and is making easy work of the gentle slope up to Ashhurst. 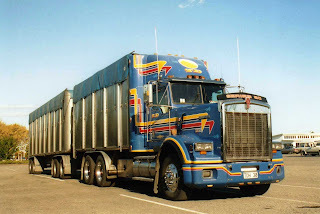 This model now has the wide grille and the larger headlamps fitted to Australian models as is the case with the "K" models of this era. 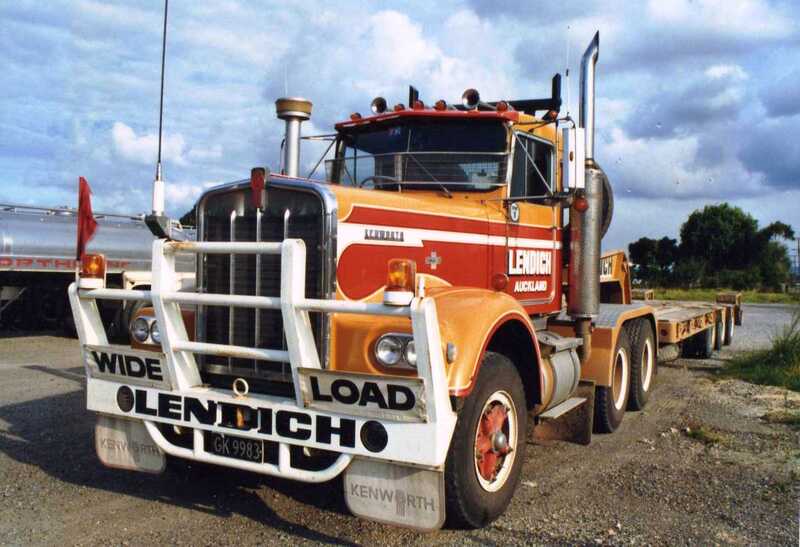 Ken Adam still uses this 1977 model daily despite the over two million kilometres it has covered. 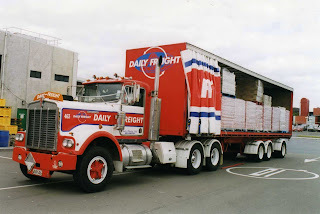 Here it is unloading at a Petone supermarket. 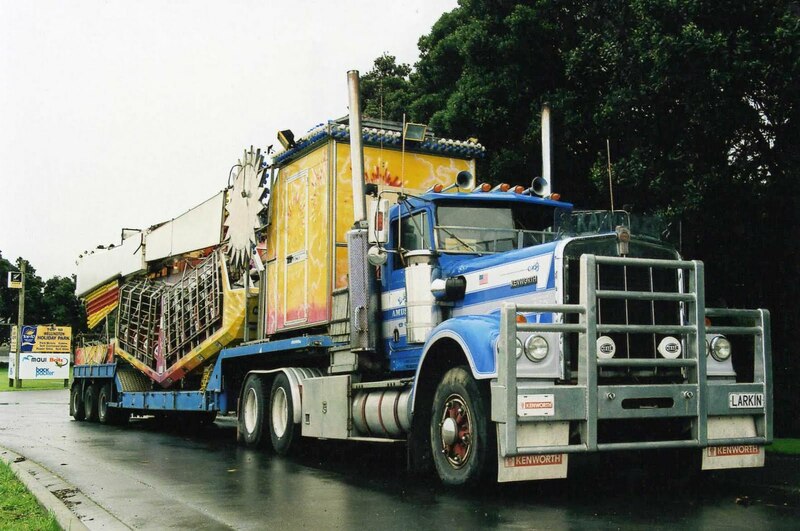 A 1984 W924AR is operated by D & J Larkin to haul fairground equipment. Decals on the bonnet sides indicate it is probably Detroit powered. John Lockley of Waihi has several unusual American trucks including this Kenworth with a large sleeper box. 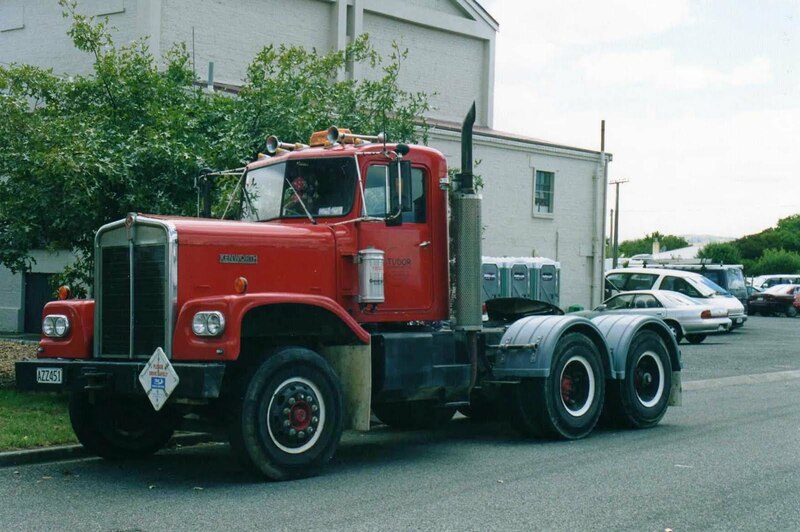 A sleeper box of this size on a chassis this short requires the fifth wheel to be mounted too far rearward for ideal weight distribution. 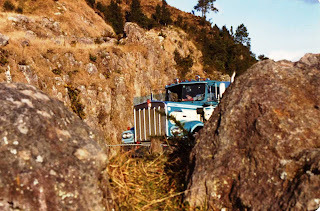 A "W" series emerges from between the large rocks as it completes the steep climb up the Kaimai Range. 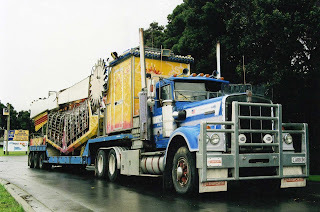 Unusual in NZ this W921R has ten stud wheels (most early "W" models had cast spoke type) and single rear axle. 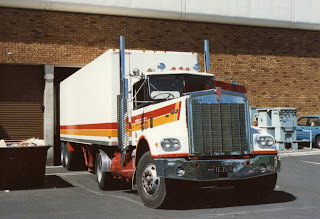 Sherson Transport's 1976 model, unloads at a Hamilton supermarket. In the late 80s Kenworth released their more aerodynamic versions of the conventional. 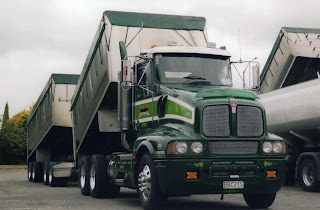 This T600A operated by TD Haulage, is a 1990 model, parked in their yard at Mount Maunganui. One piece curved windscreen, smooth guards and shapely mirrors apparently made a significant difference to fuel consumption. A 2004 T404s is operated with a low loader by Quality Demolition of Seaview in the Wellington area. 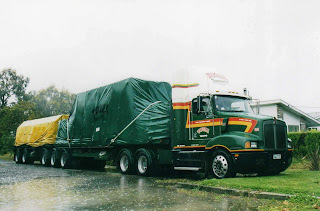 A loaded B-train behind a 1999 "T" model sits in the pouring rain at Masterton Motor Lodge. I'm sure the driver would be hoping it will be dry when he gets up in the morning. 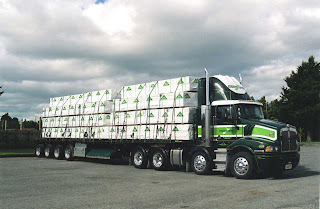 Eight axles and a big load on this 2008 T404s at Copthorne Solway Park Motor Lodge in Masterton. 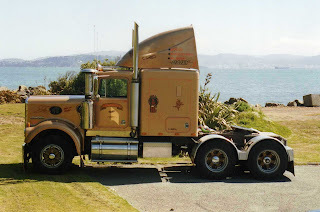 Salter Cartage T401 of 2003 vintage is parked at Masterton Motor Lodge in the afternoon sun. 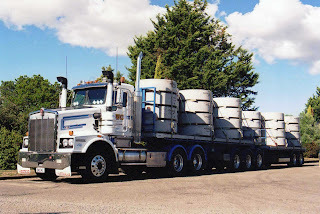 This tanker is used for carrying timber preservation chemicals. 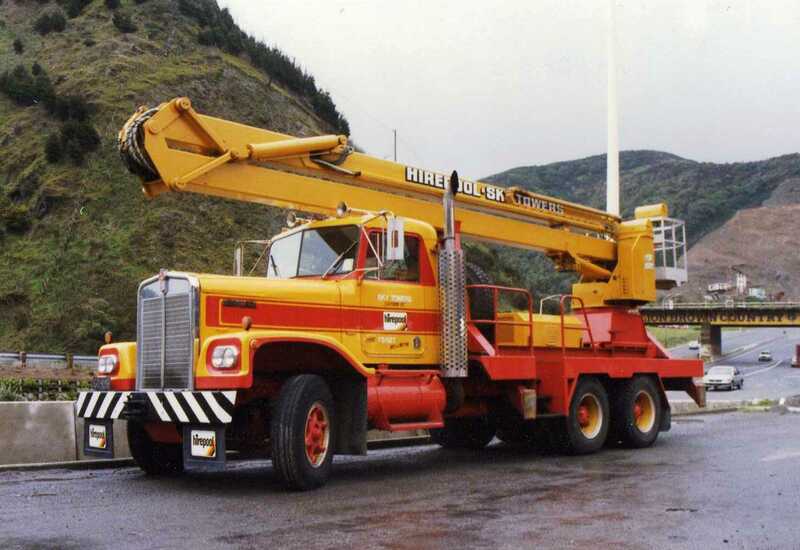 The C500 models were designed for the construction industry and other rugged use. This 1996 model parked in Petone is operated by Daniel Smith Industries who specialise in crane and heavy equipment hire and operate from Rangiora in NZs South Island. Kauriland Tanker Solutions T404s hauls a B-train of fuel over the Rimutaka Hill Road to be distributed to service stations in the Wairarapa where my home town of Masterton is located. This 2000 T800 is operated by TD Haulage of Mount Maunganui. 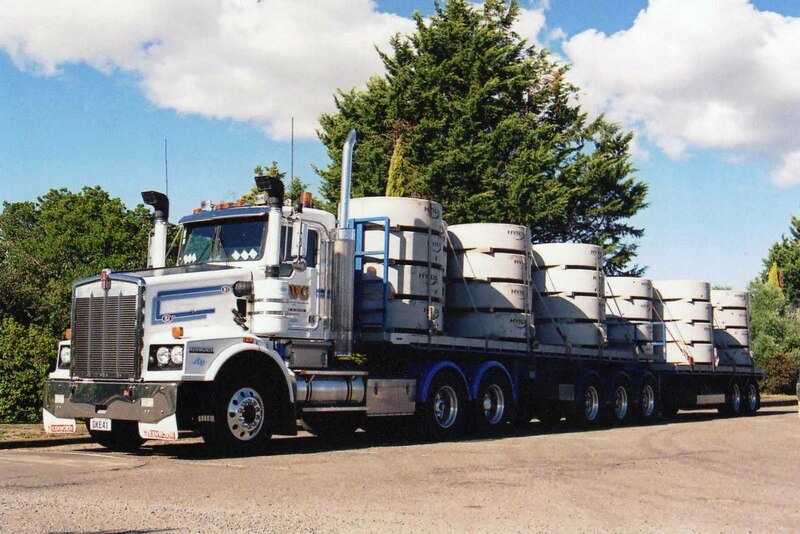 Southern Water Cartage operate this 2006 T650 , loaded here with a B-train of concrete troughs. The T604 was an Australian development with a higher mounted cab. 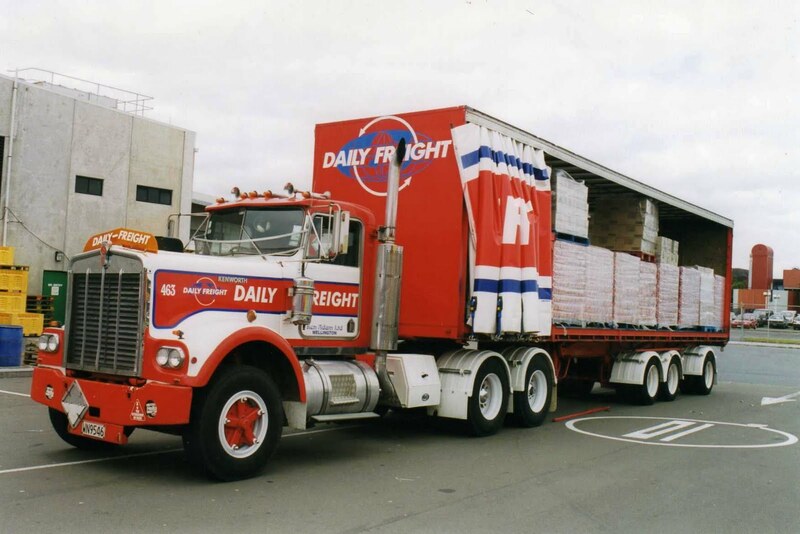 This 2002 model tipper with trailer is in Freightlines livery. 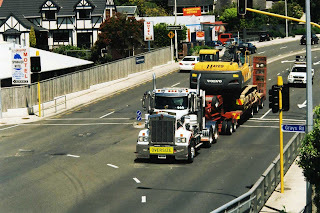 At the intersection of State Highway 1 and Gray's Road, at Plimmerton, there is a high pedestrian overbridge which is ideal for truckspotting. 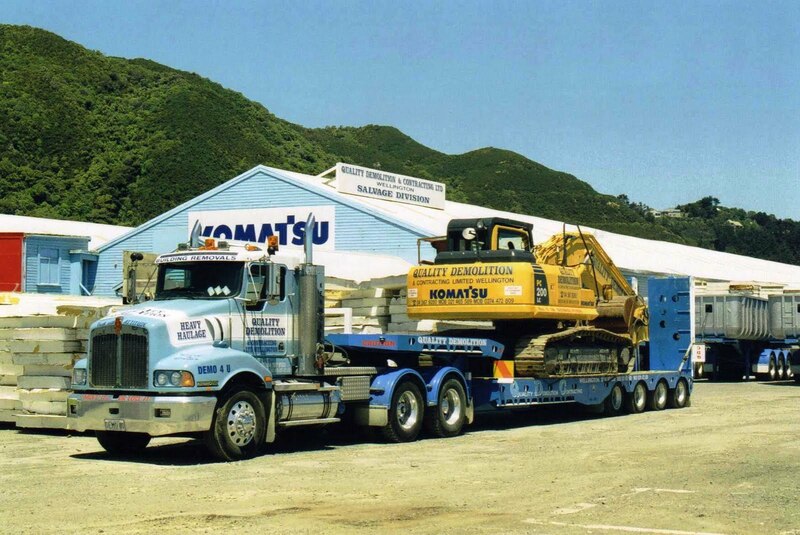 This is Hurlstone's T950 with low loader and divider dolly heading North with several tonnes of Volvo. 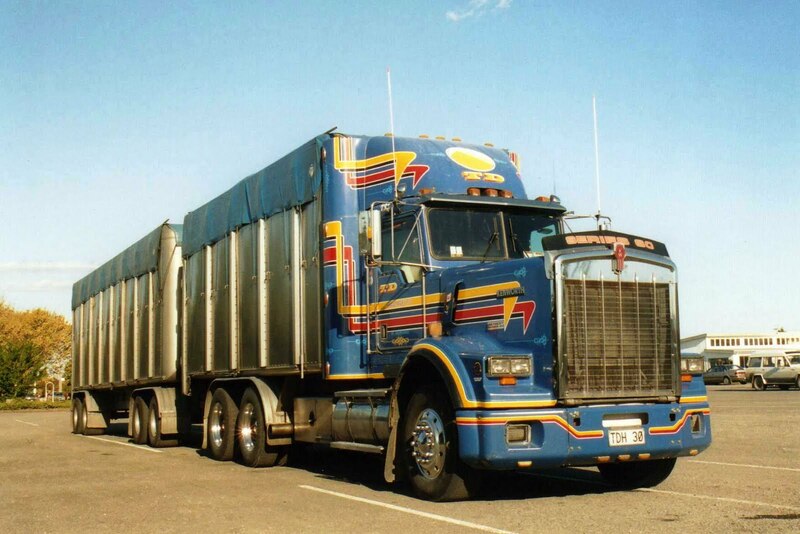 The T950 has a tall grille to house the huge radiator necessary for the cooling of engines around 600HP.